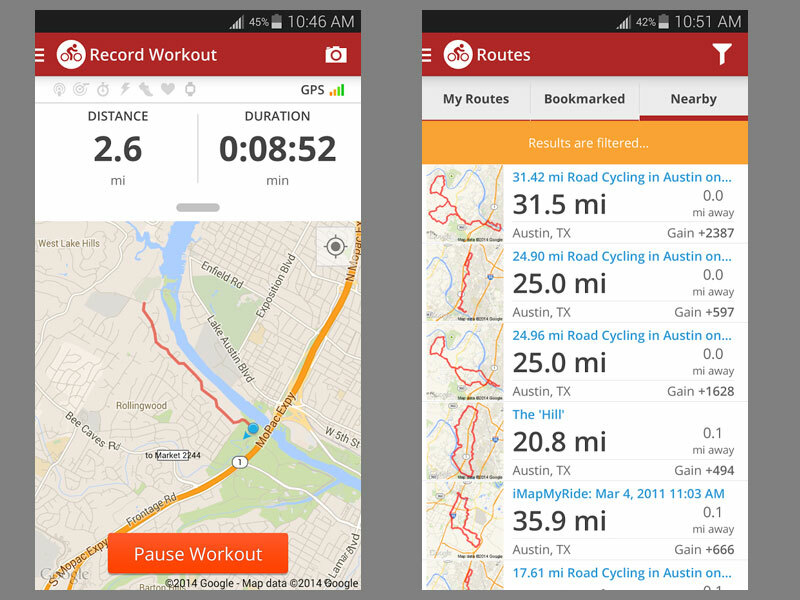 New cycling apps are constantly flooding into the market. Whether you want to record your ride, monitor your training, or hassle your local council to improve the roads: there’s an app for that. Below is a list of the most useful cycling apps we’ve found – but there are new creations appearing every week. If you’re using one that isn’t listed, let us know in the comments. The more supported platforms the better: iPhone and iPad (iOS), Android, Windows, or whatever. Should you use your phone or a cycling computer? One of the most popular GPS cycling apps offers an array of handy ride logging functions which are then uploaded to your online Strava profile. The app keeps track of your ride stats as you travel, including speed, time and distance all the while tracking where you’ve been. At the end of your ride, you can view further stats such as calories burned and elevation ridden – plus whether you have set a new record on any of the numerous Strava segments. TrainingPeaks is one of, if not the most, popular platforms used for tracking athlete performance. Coaches can input workouts, or if you’re self coached you can use it yourself. If you want to schedule activities for future, you do have to upgrade to the paid for version ($19.95 – £15.04 – USD a month). The app is a useful add on which means you can always access your training schedule, see coaches comments or add your own. Perhaps this is a bit of a cheat, as MyWindsock isn’t available as a phone app yet, but the desktop version works well. The founder – Ben Norbury – wanted to check how weather conditions would affect his upcoming time trials, hence creating the application. MyWindsock can tell real-time data on the weather along your planned route, if you upload a GPX file. Alternatively, you can copy and paste the URL for a Strava segment into this clever piece of software to see what sort of conditions you can expect – nearly all UK time trial courses have a segment if not several. You can also feed MyWindsock a Strava leaderboard, to see which weather conditions have produced the fastest times. 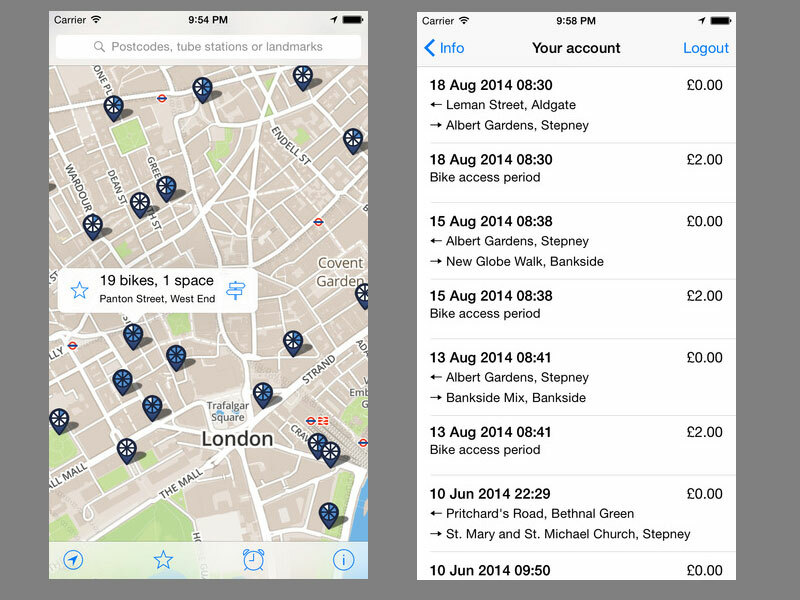 This independent app developed by Alexander Baxevanis is a must-have for anyone that regularly uses the London Cycle Hire scheme, particularly if they use an array of routes. Not only will it help you plot a cycle-friendly route to a Cycle Hire docking station in any given area, it will also tell you how many bikes and spaces there are on an easy-to-follow map. You can also use the app to view your Cycle Hire account details, including recent journeys. Does what it says on the tin. If you’re using your phone as a cycling computer, this app pretty much gives you all the data that you might want. It’s Strava compatible, has the capability to call a chosen contact in case of emergency and claims to operate 12% more efficiently compared to any other mobile fit tracker app – saving battery life. Use the Wahoo app to track your rides, and pair it with Bluetooth sensors like heart rate monitors, speed sensors and some power meters. If your devices use ANT+, then Wahoo has a Wahoo Key plugin you can use to pair them too. Wahoo’s app is compatible with others – like Strava, MyFitness Pal and Training Peaks, so you can upload your ride there too. 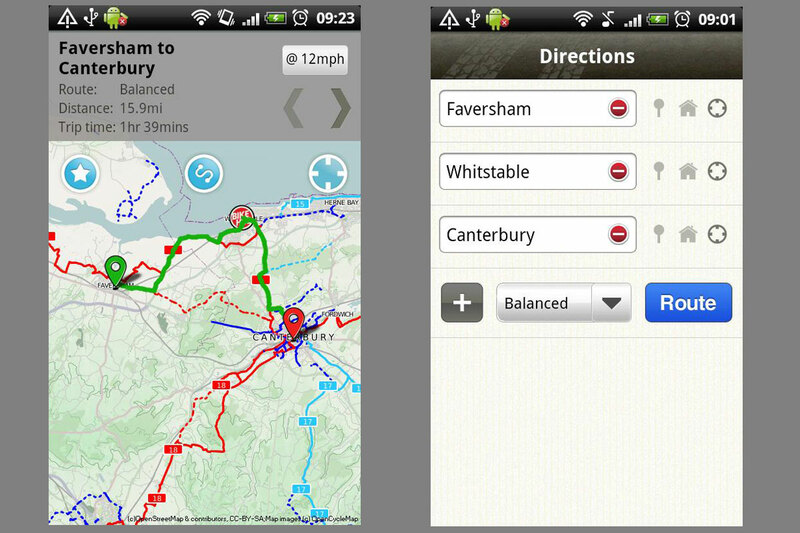 There’s a multitude of customisable pages so you can see all your data, plus GPS maps on board too. This app allows experts and enthusiasts alike to add routes, which users can browse from anywhere in the world. In app purchases mean that users can buy premium maps provided by the Ordnance Survey. The files are quite large so you’ll need to ensure there’s plenty of space on your smartphone. A big plus of this app is its versatility: use it for road riding and mountain biking, but also for walking and hiking. 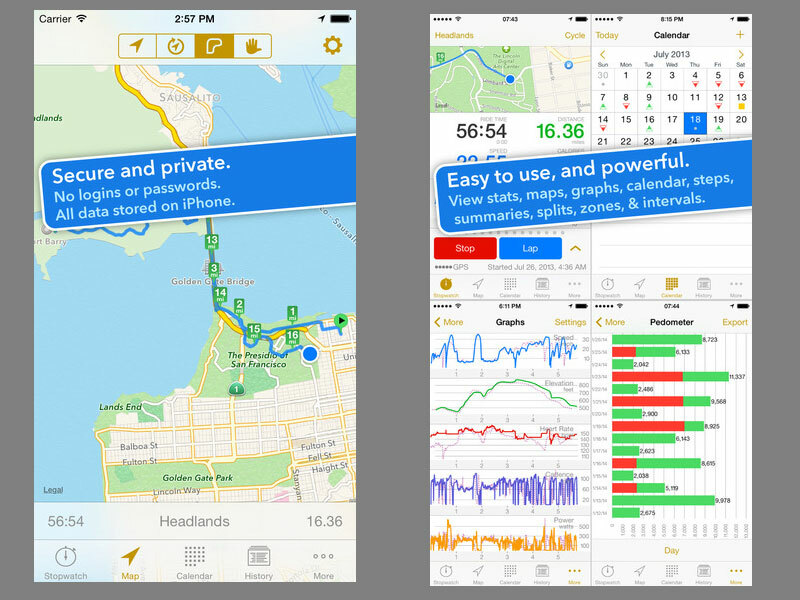 This comprehensive fitness app utilises the GPS functions of Apple devices to create a host of statistics to help you log and improve your cycling performance. Records speed, time, distance and has an extensive array of workouts to follow, making it a virtual training partner. The app also includes built-in announcements, so that you don’t have to take your eyes off the road to know how you’re doing. 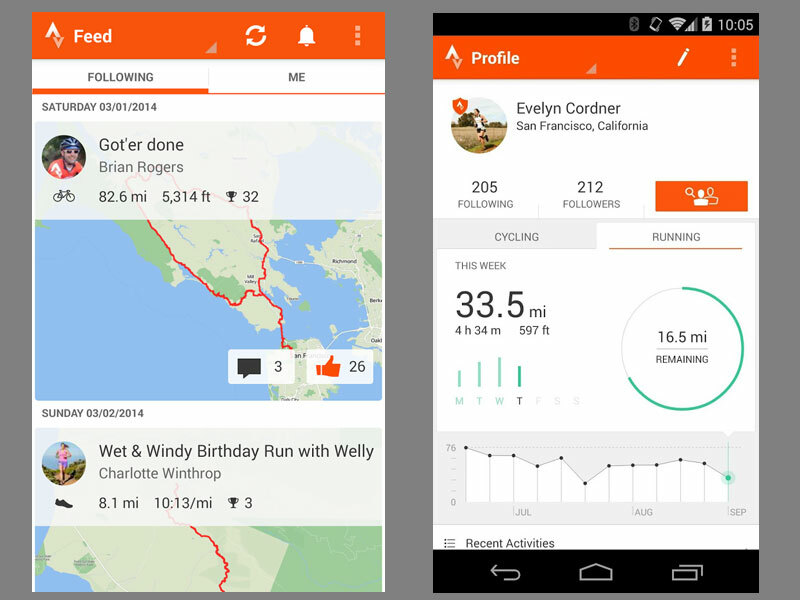 Recorded data can be uploaded to Strava and other ride sharing websites. 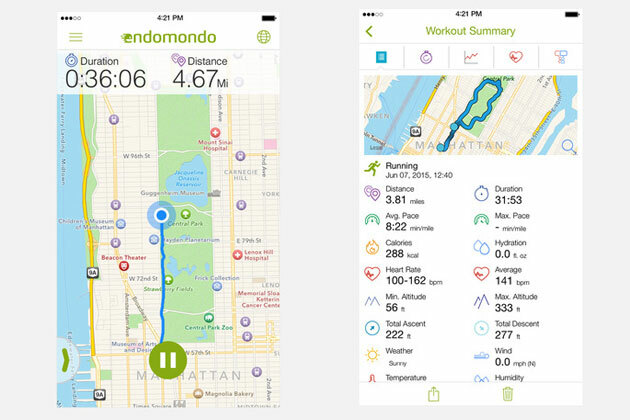 Rather than just tracking and logging your activities, Endomondo is designed to be your personal trainer and as such features ‘audio encouragement’ to motivate you during exercise, including how you are performing against pre-determined goals. 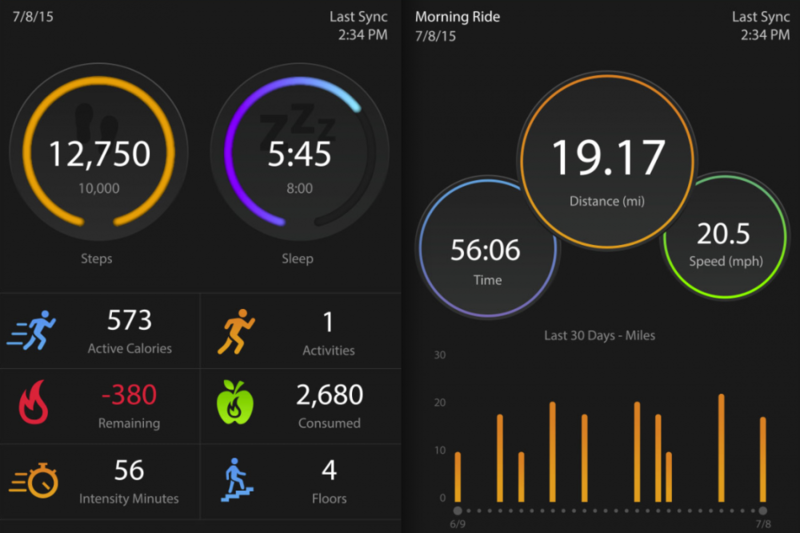 As well as cycling and running, the app can also track around 40 other sports. Garmin’s Connect software provides a link between your mobile device and Garmin GPS device to share data. The connection can work both ways, with a compatible Garmin GPS able to display weather data and notifications on your handlebars. Data from the Garmin device goes into the mobile device, giving you a range of ways to display the numbers: charts, graphs, maps, etc. LiveTrack lets friends follow your progress online as you are riding, and you can compete in weekly challenges and wirelessly upload activities. Record any ride on Strava or Garmin Connect, Endomondo or Polar and see it played out for you on a 3D map, complete with speed, heart rate and power data if you like and any snaps you took along the way if you uploaded them to Strava. Map My Ride was one of the original ride-logging services, and despite fierce competition for space on your phone from the likes of Strava, it still offers a lot. 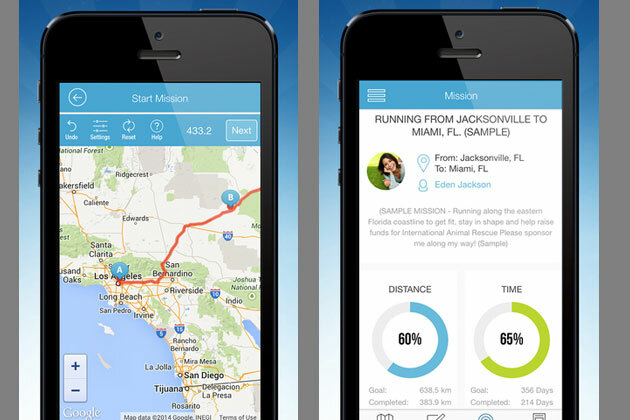 The app records a host of data from your ride, including distance, speed, elevation and a detailed route. All of this can be uploaded to the Map My Ride site for detailed analysis and sharing with other users, if you wish. Like Strava, Map My Ride also includes timed sections, called Courses, where you can try and set the fastest time. Few road cyclists can boast a pothole-free journey on their local roads, and up until the handy Fill That Hole app came along it was a struggle to report tarmac carbuncles. Created by national cyclists charity Cycling UK, the plain-looking yet highly functional app allows you report the location of potholes, which are then forwarded onto the relevant local authority for attention. You can also add a photo of the offending crater. We’ve tried it, and it works. The app of the best-selling book, 100 Greatest Cycling Climbs, enables the user to locate and ride all of the hills featured in the popular publication. Info and stats are presented for each climb, and riders can see how they measure up against other cyclists as the app links to Strava’s segment KOMs. 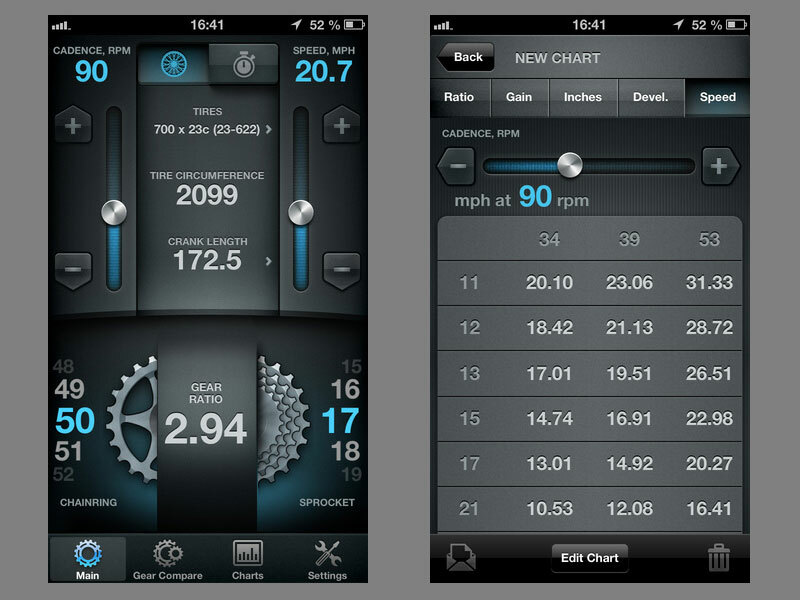 The slick-looking bicycle gear calculator from Matixsoft allows you to compare gear ratios on your bike to optimise your set-up. There are numerous variables that can be input, including tyre width, wheel size and crank length as well as the more obvious number of teeth on your chainset and cassette. It’s not an app for everyone – but the technically-minded will love its graphs and calculations. A Sat Nav for cyclists, Bike Hub Cycle Journey Planner will plot a route from your selected start and finish points using not only roads (omitting dual carriageways and motorways), but also cycle paths and permitted paths. The app is UK only at present and uses mapping from cyclestreets.net. We like the fact that you can choose a range of routing options from quickest route to quietest route, and it will avoid hills ‘where possible’. There’s also a function to find bike shops in the locality. The weather plays a big part in any cyclist’s life. There are few cyclists who don’t check the weather forecast before leaving on a ride so that they can select the right clothing and know what they’re in for. 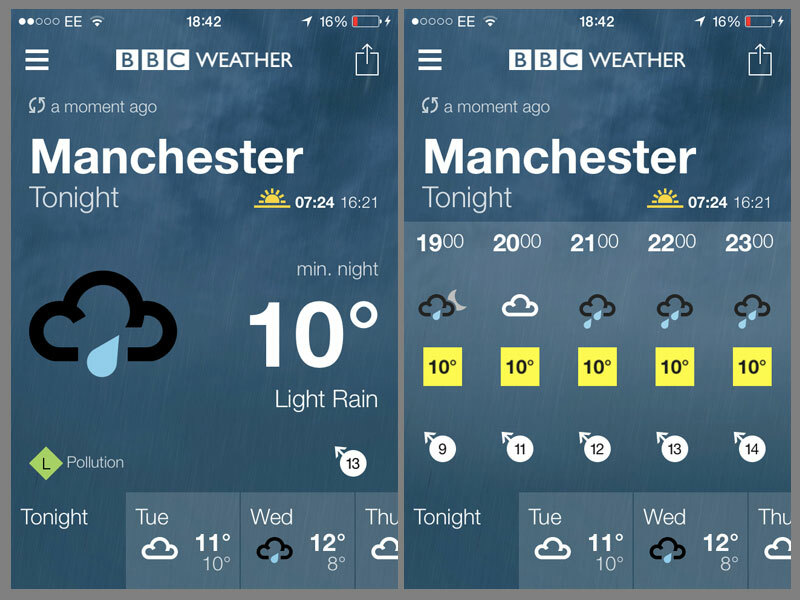 We’ve found the BBC Weather app to be simple and relatively accurate – the best of the weather bunch by far. This is one of those apps that you hope you’ll never need. 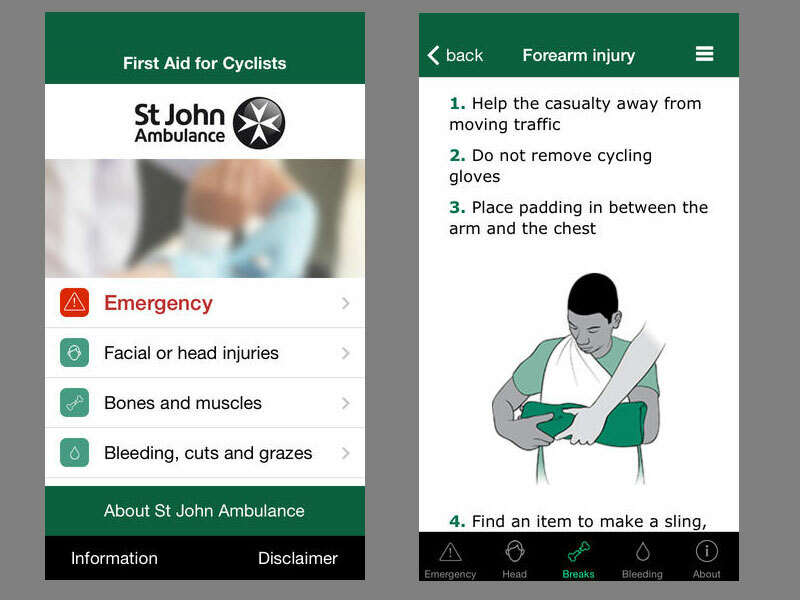 St John Ambulance has produced a free app that guides you through first aid treatment for a range of common cycling-related injuries, so that you can treat yourself or others at the roadside. The app deals with a very wide range of injuries, giving step-by-step advice and diagrams, plus it tells you what to do in a serious emergency. Rather than dealing with individual rides, My Virtual Mission allows you to set an ultimate goal and then work towards it. So, for instance, you can decide that over the coming few months you are going to cycle the same distance as riding from the east to the west coast of the USA. Rather than actually cycling it, you set up the virtual journey on the app, and every time you cycle (or run) it plots the same distance on a map of your virtual journey, adding rides on each time you do them. As a goal-setting and motivational tool, it’s good fun. You could also use it to set up a long-distance ride for charity fund-raising, with the app including a function to track how much you’ve raised.